BIG SALE!! FENG SHUI PROTECTION CURES BIG SALE!! A Feng Shui must!! 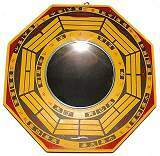 The traditional wood Bagua mirror. Hang it facing the entrance of your home to deflect unwanted and negative energies! Available in both concave or convex mirrors, the concave mirror deflects Sha Chi or negative energy away and the convex mirror expands positive Chi energy coming into the home. Luo Pan means that which contains or encompasses all within Heaven and Earth. The Luo Pan has been used for over 2000 years by Feng Shui Masters to interpret the secrets of time and place, that is the sacred Angles or the 4 compass points and the cycles of time. 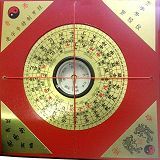 Here is an inexpensive, authentic wood Luo Pan Compass with all the necessary rings used by most schools of Feng Shui and two cross check levels. It is perfect for beginners, students and those who need extra Luo Pan Compasses. 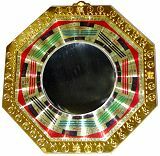 A beautiful twist on the traditional Bagua, this metallic gold 6" wide Bagua mirror has I-Ching symbols, Feng Shui calligraphy and dazzling metallic gold, red, blue and green coloring. Hang it facing the entrance of your home to deflect unwanted and negative energies! Available with a concave mirror, the concave mirror deflects Sha Chi or negative energy away from the home. Ancient symbol of Protection & Good Luck! For millennia people have used the Evil Eye protection symbol to ward off envy, hate mongers and bad luck. The "Eye of God" is a universal symbol of these authentic Turkish blue glass, hand made Evil Eye Amulets. These amulets known as Nazar Boncugu, can be used as pendants, window and car charms and wall hangings or plaques. Available in 9 sizes from 1" to 6" wide to suit your need. 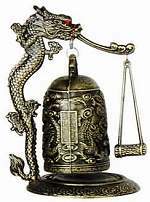 Embossed brass Chinese Dragon gong bell with brass mallet. The large bell gong has a long, penetrating, soothing tone sound perfect for meditation or clearing the mind. The bell is decorated with embossed dragons and Feng Shui symbols. The gong is sounded before meditation to banish duality or thoughts of good and evil, it allows the mind to focus on the sound of harmony. Use to clear negative energies in the room and clear away bad Feng Shui or bad luck. 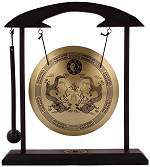 Chinese Brass Lucky Coin Gong with wood mallet has a mellow sound perfect for meditation. 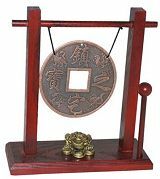 This unique gong has a large authentic lucky coin of with Feng Shui calligraphy symbols of prosperity, good fortune and happiness and is suspended from a wood pavilion shaped stand with a wealth frog on gold coins beneath. The gong is sounded before meditation to banish duality or thoughts of good and evil, it allows the mind to focus on the sound of harmony. Beautiful traditional style, Chinese Brass Wind Gong with wood mallet has a deep mellow sound perfect for meditation. 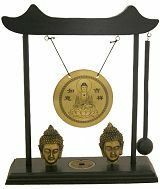 The brass wind gong is illustrated with Yin Yang, I Ching and Chinese Zodiac symbols and is suspended from a wood pavilion shaped stand. The gong is sounded before meditation to banish duality or thoughts of good and evil, it allows the mind to focus on the sound of harmony. Repeated use allows one to still and soothe the mind at the sound of the gong. Beautiful traditional style, Chinese Brass Wind Gong with wood mallet has a deep mellow sound perfect for meditation. The gong has an image of the meditating Buddha on Lotus with symbols of enlightenment and peace and is suspended from a wood pavilion shaped stand with two decorative Buddha heads to inspire peace and calm. The gong is sounded before meditation to banish duality or thoughts of good and evil, it allows the mind to focus on the sound of harmony. Traditional style, Chinese Brass Wind Gong with wood mallet has a deep mellow sound perfect for meditation. 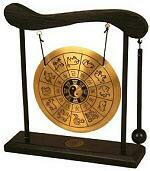 The brass wind gong has twin imperial dragons and yin yang symbol and is suspended from a wood pavilion shaped stand. The gong is sounded before meditation to banish duality or thoughts of good and evil, it allows the mind to focus on the sound of harmony. Repeated use allows one to still and soothe the mind at the sound of the gong.